The first thing that a visitor to your home will come across is an entrance hall. As we have been always taught, “first impression is the last impression”, it is very important for us to put our best foot forward while welcoming guests. We cannot afford to lose our status just because of a boring entrance hall. 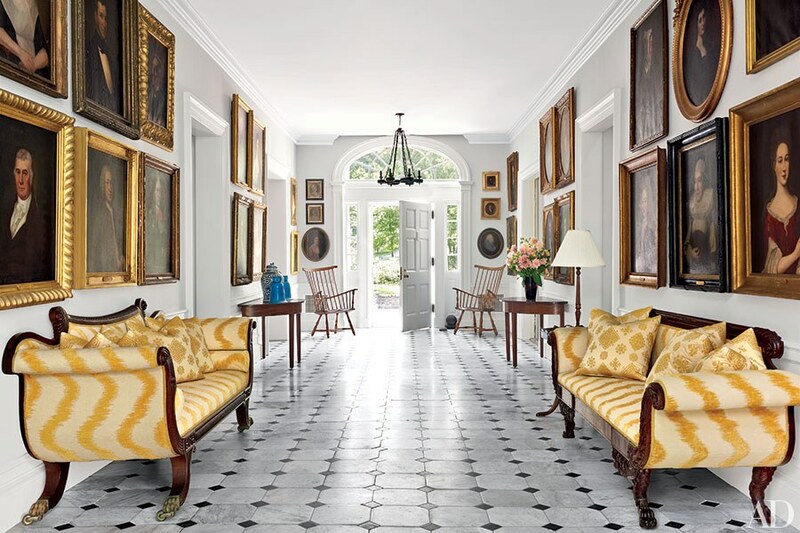 Hence, to sweep the guests off their feet, the entrance hall needs to be something that leaves them with their eyes wide open and jaws dropped. 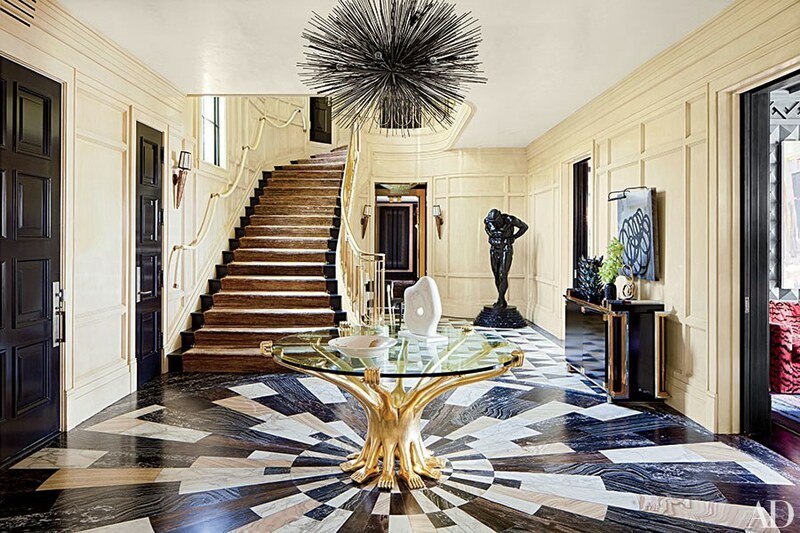 Let’s have a look at some of the most modern entrance halls in the world that give us an idea on how to design one for our home too. 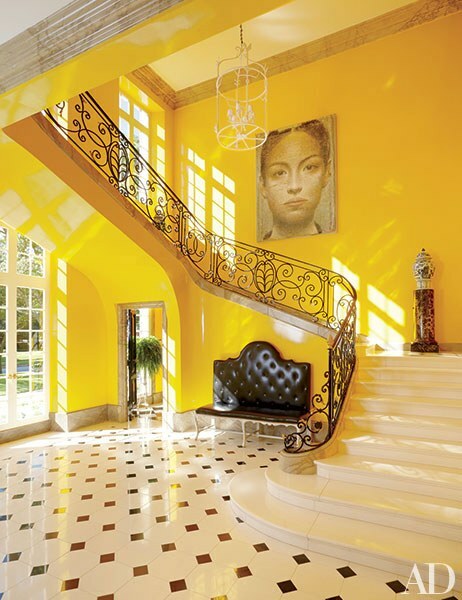 This entrance hall has been designed by interior designer Miles Redd for a 17th century French style mansion in Houston. The yellow colour is symbolic of vigour and energy and also of enthusiasm. The colour combination along with the decor is a perfect mix of traditional French style interior design and contemporary art. The yellow colour is the one that is donned by taxis and it gives a brilliant backdrop for an Eric Peters painting. The plaster chandelier by Stephen Antonson and a button-tufted bench by John Rosselli and Associates bring out the real beauty of the room. You can emulate this design in your home too by selecting a suitable colour for the walls and having a painting hung above the stairs. This is a picture from Obercreek, the Hudson Valley farm of investor Alex Reese and his wife, architect Alison Spear. The entrance hall is covered with family portraits and as one walks on the stone-floored entrance hall, one gets to meet all the predecessors of the family. The entrance hall looks like that of a majestic family and the beautiful colour combination which comprises mostly of white, adds a tinge of calmness and serenity to the hall. The yellow striped sofas and wooden articles along with the lampshade matching its colours with the walls, make the room even more elegant. 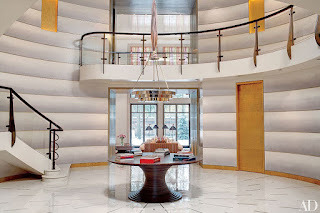 If you ever happen to visit the home of the founder of Net-a-Porter, Natalie Massenet, you will come across this amazing entrance hall. The entrance hall has been decorated by Michael S Smith and is basically centred on two strong octagonal elements. The two elements are a metal ceiling fixture and a vintage Karl Springer table from Liz O’ Brien. The Kravet carpet adds to the splendour of the room. Don’t forget to notice the fireplace that adds warmth to the hall. The contemporary works of art play a crucial role in enhancing the beauty of the hall. The design together with all elements adds a sense of warmth and security to the dwellers. Black is one of the most sophisticated colours in the world. It has its own tinge of professionalism and elegance attached to itself. 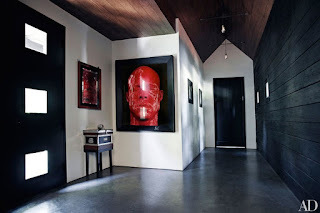 The entrance hall shown here is by Steven Klein, the famous photographer. The entrance hall in Bridgehampton, New York has a Klein image of Brad Pitt which comes to life once one sees it. The horizontal boards amplify the beauty of the room and make it look quite long. 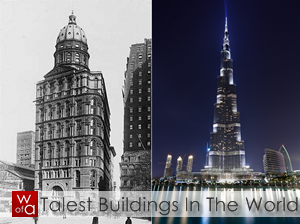 Notice how the peaked ceilings add a sense of extra height to the hall. The windows, doors, door pane, glass etc. are square in shape and the panelled door gives a feeling of security through its reassuring presence. 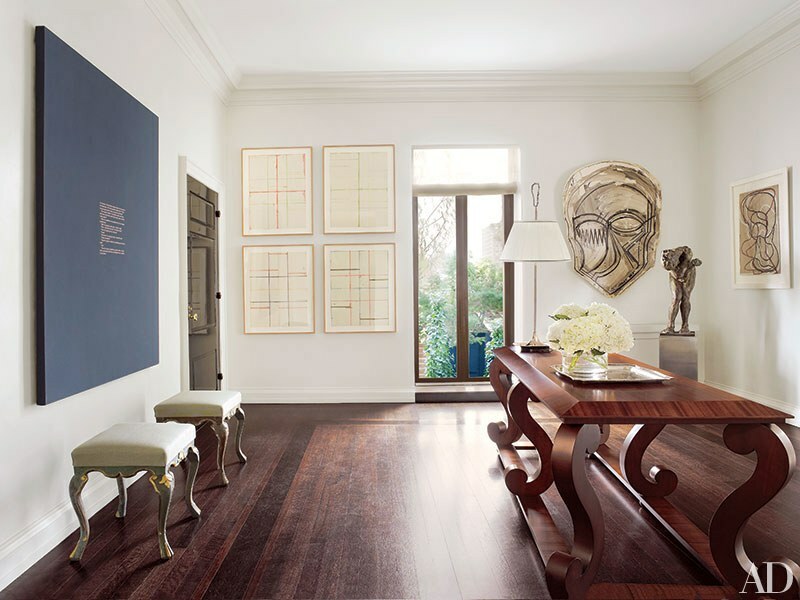 Decorator Vincent Wolf had conceived this entrance hall as a mini gallery to display amazing works by Richard Prince, Brice Marden, Eric Fischl, and Thomas Houseago. A custom made table anchors the space. The space is large and quite spacious too. This home is in New York City. In case you want to have cocktail parties at your home, then this kind of room will prove to be perfect for you and your guests. The large table can help to hold the wine bottles. Notice how the wood tones of the table actually render it as emerging out of the backdrop and somehow the design reverberates its music in your eyes. How about tricking your guests with optical illusions? If you have such an entrance hall where perspective and design conspire to trick people, then nothing can be better than that. This hallway looks quite lengthy, but it is actually only a few metres long. So, what gives it such an appearance? The hall gets the appearance from a mirror that is fitted at the end of the hall. The mirror covers the entire hind wall. Use mirrors at your home for enhancing the size of the entrance halls, in case you live in an apartment where space is less and there is dearth of room for interior designing. This entrance hall has perfectly used the neutral colours for its decor. The white colour stands for peace and calmness and the glass panes along the stairs give a sense of transparency. This ingenious interior design makes the entrance hall look quite spacious and the white colour enhances this effect. If you have stairs running inside your room, then you can opt for this idea which can be rendered with minimal investments. Try using showpieces of colours contrast to the white colour. Just see how the mustard yellow coloured articles have shined out in the white backdrop. This is one of the ideas that are seldom implemented by people. However, the idea is slowly catching up with plant lovers. Welcome nature inside your home by having a tree planted right at the centre of the entrance hall. Trees and plants have a soothing effect on our minds and having a plant right inside the entrance hall will inspire the environmental conservationist within us. This is a good way to mix natural elements with modern design and instead of having artificial plants inside home, why not have actual growing trees? Interior vegetation may be a good idea for your home, but you also need to take care of the plant, lest it withers and dies down. A combination of onyx and marble is a perfect blend for interior design. The entrance of Bel Air in California, i.e. the one shown here, have a Pedro Friedberg table rising from the floor like a fountain. The decor has been designed by Tichenor & Thorp Architects and interior designer, Kelly Wearstler. The tones of the floor are quite appealing and the cabinet of lacquer and metal add a traditional look to the interior. This country house in Moscow has been designed by Gabhan O’Keeffe, who has painted the walls. The black walnut table and the stone floor along with the ceiling render a radiant feeling to the decor. The pattern of lime and mosaic helps to enhance the grandeur of the room. Notice how the stairs have been constructed to give the room a futuristic look. 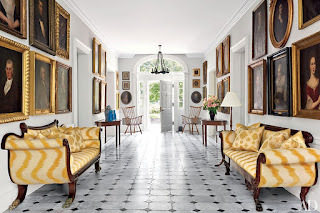 So, these were some of the entrance halls that you can mimic or draw inspiration from for your sweet home too.